I spent last weekend at Las Cruces Comic Con. Las Cruces is a relatively small town with a modest-sized convention center, so this was a much smaller event than say Phoenix Comicon, Emerald City Comicon, or the granddaddy of the them all: San Diego Comicon. Still, it was a great event with media panels featuring such people as David Zayas who played Sal Moroni in Gotham and Wendy Schaal who voices Francine Smith in American Dad. Lots of people turned out in some really inventive costumes and I was impressed with the photo area the convention organizers set up, which just allowed people to play. 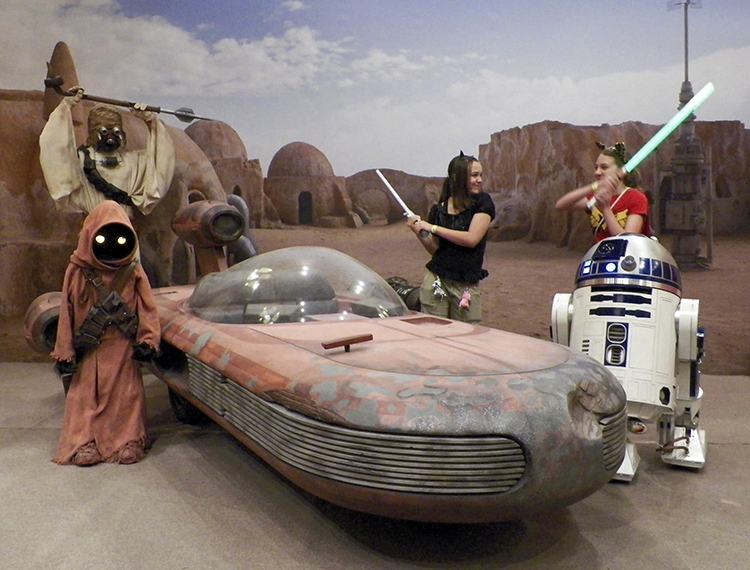 Here you see my youngest daughter and a friend having a light saber battle on Tatooine. For me, it was an unusual convention in that I was the only writer in attendance. The organizers surprised me by giving me a “special appearance” credit in the program guide which was wonderful. Even though I was the only writer in attendance, I still managed quite a bit of networking. I got to speak to several of the artists in Artist’s Alley, had a productive chat with a film production team about possible book trailers, and of course, I got to speak with several friends and fans, some of which I knew from events in Phoenix and Tucson. Unfortunately, at some point on Saturday I ate something that really disagreed with me. I didn’t sleep well Saturday night and I spent Sunday at the booth with my stomach churning. Still, I managed to have several nice conversations with people and by Monday morning I finally felt better. Another feature of the weekend was that the DSL line to my house went dead on Friday, so even though I was at a local convention, I had limited internet contact. Fortunately, I still had access to wireless through the Convention Center, but it always amazes me how helpless I suddenly feel when instant communication—something that has come into existence during my adult life—has gone away. Still, I find these experiences helpful because I can channel them into my steampunk novels such as The Brazen Shark where my characters get to discover the novelty of instant, international communication, or my horror novel The Astronomer’s Crypt where my characters are literally and figuratively in the dark through the night and can’t even communicate with each other reliably through a building or across a mountaintop. On Monday night, my older daughter called to say she got to hear Bill Nye the Science Guy give a talk in New Orleans. She said the talk was very inspirational and came right when she needed some encouragement about her recent decision to pursue a mathematics major. In addition to generally encouraging interest in STEM fields, Nye mentioned the Planetary Society’s recent success raising money for their LightSail Project. 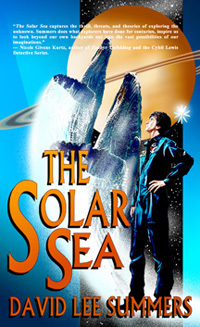 In some fun synchronicity, the next day, Lachesis Publishing shared a guest blog post I wrote about creating a reading guide for my novel The Solar Sea. The novel imagines the first voyage to Jupiter and Saturn aboard a solar sail spacecraft. The reading guide presents activities and questions for any classrooms or book clubs who might be interested in reading the novel.